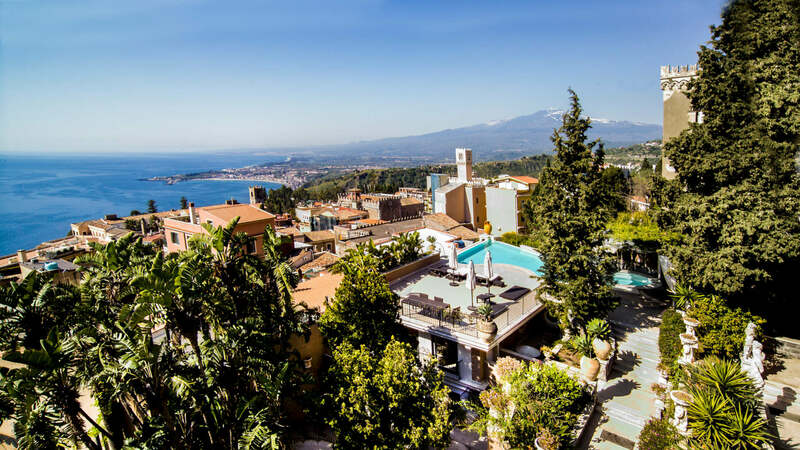 Pinasters, scented bougainvillea and citrus trees, stone benches in front of breathtaking panoramic points, little elegant streets with fancy boutiques and restaurants, an ancient and glorious history and an exceptional, classy atmosphere: Taormina has it all. A thousand words could not be enough to describe the charme of this little sicilian gem. An ancient Greek colony that now houses the second most important ancient theatre of Sicily, which is today its main landmark as well as the amazing setting of the VIP-crowded “Taormina Film Festival”: the view from here is really striking, as the hamlet is located on a mountain overlooking the stunning Naxos bay with its sandy beach and the Ionian seashore, and you can admire Mount Etna in the background. The beauty of Taormina is legendary, worldwide known and surely well-deserved. You cannot go to Taormina and not fall in love with it, especially if you’ll choose to stay in our glamorous Villas in Taormina! It’s not a mystery that writers, poets, philosophers, have been glorifying its magnificence since the 18th Century, and that’s why the hamlet is nowadays the most exclusive and refined holiday destination of Sicily along with Panarea and Pantelleria islands. It won’t be hard for you to perceive it while walking through its lovely narrow streets sided by elegant palaces rich in flowering balconies, with luxury boutiques and cafés, top-quality restaurants and refined antique shops. Taormina is really one of the most beautiful and magic places in the world, and also a must see destination for your holiday in Sicily. Taormina can be easily reached by car or by cable-way; at the foot of the town, astonishing beaches are perfect for enjoying the peaceful atmosphere surrounding the area. Isolabella is a tiny little island just a few metres from the shore, connected with the mainland by a strip of land that tides often cover; for the variety and uniqueness of its landscape, both on the island and under the sea, it is a Nature Reserve and really deserves at least a visit during your holiday. 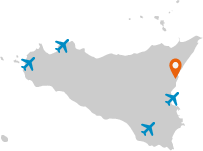 Our villas to rent in Taormina are located near the most beautiful city’s main sights. Giardini Naxos, the little seaside resort just next to Taormina, houses a lovely sandy beach as well. Daily excursions must include the picturesque little hamlet of Castelmola, perched on top of a mountain overlooking not only Taormina but the whole Ionian coastline: the panorama is even more astonishing from here, especially if enjoyed while sipping a glass of local almond wine – which was invented right here centuries ago.